When the Pharaohs of ancient Egypt died, they were buried with everything they would need to sustain them in the afterlife. In uncovering some of these tombs, scientists found large earthenware jars full of wheat which would still sprout even though it was almost 4 000 years old! 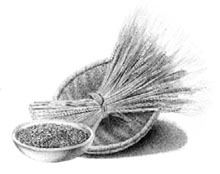 The first wheat food was probably the whole wheat berries themselves, which were stripped of husks and chewed. Wheat’s presence in the human diet is described in the Bible: “ Give us this day our daily bread.” Science similarly verifies its role as a dietary staple since ancient times, as archeologists have found 6 700 year-old wheat berries in the ruins of an ancient village in Iraq. Wheat, a member of the grass family, provides more nourishment for more people worldwide than any other food. While rice is the most common grain in Asia, wheat is the dietary base in Africa, Europe, North and South America, Australia, and a large part of Asia. In many developed nations, wheat provides 40-60% of the calories in the diet. The Industrial Revolution forever changed the way we eat wheat. As people began to move away from agricultural communities and into large cities, a serious problem developed: How could the flour be made to last long enough to feed large masses of people? The grain processor solved the problem by taking out some of the things which made the flour spoil - notably, the nutrient-rich outer bran and germ layers of the wheat berry, which contains most of the plant’s vital lipids, sterols, vitamins, and minerals. In fact, modern milling subjects whole-wheat berries to about two dozen processes before they’re transformed into table flour. However, this modern solution created new problems. *Adapted from Schroeder, H.A. American Journal of Clinical Nutrition 25:562, 1971. Processing removes wheat’s bran, germ, and oil. Outer layers such as the bran contain most of the vitamins and minerals, and are sold to ranchers for livestock feed. (In this respect, cattle eat better than we do!) Wheat germ and wheat germ oil, rich sources of natural vitamin E and important lipids and sterols, are sold as foods and supplements. After removing most of the nutrient-rich portions of wheat, the grain processor leaves unbleached flour, which still contains certain nutrients that attract insects. This flour is then treated with bleach, which oxidizes proteins and other nutrients in the flour and extends its shelf life. It is then synthetically “enriched” by adding some of the same types of nutrients which were removed in the milling process, typically at lower levels than were present in the unmilled food. Ironically, “enrichment” usually replaces only three to six of the over 20 items originally removed! How Much Nutrient Value Is Lost Due to Wheat Refining? In refining whole wheat to make white flour, much of the wheat’s original nutrient value is lost. Removal of the oils (lipids and sterols) to avoid rancidity is only part of the story. As the chart below from the American Journal of Clinical Nutrition shows, the majority of the remaining nutrients are lost to processing as well.